How to read the this website by your language? We recommend you will use the website translation functions. 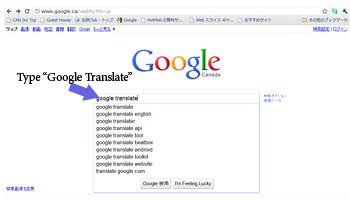 1, Please go to your language's Google Web page and type "google translate". 2, Go to Google Translate page. 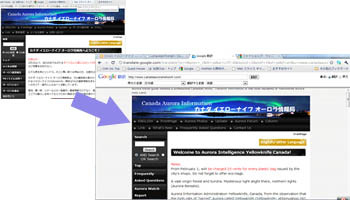 4, www.canadaauroranetwork.com will be shown the right side. click it. 5, Congratulations! Now, you can read the website by your language! 1, Go to Google page. 2, Download and install the Google Chrome. 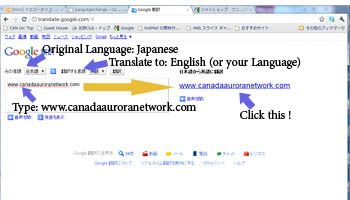 3, Open the http://www.canadaauroranetwork.com by Google Chrome. 4, Google Chrome ask you "Do you translate this page?" 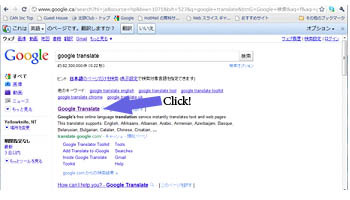 You can read the lots of webpages by using the Google Translate function. As you know, This function have about 65% translation accuracy. Therefore, you may have unreadable some our pages. Please see some linked site and use translation function to know right information. Thank you contact our website and interested about the True North. Copyright © 2019 Franklin House Maketing All Rights Reserved.